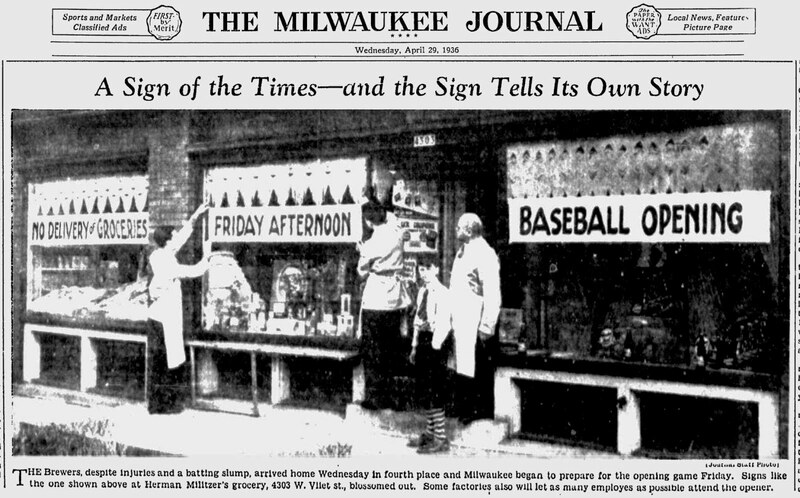 On Wednesday, April 29, 1936, the Milwaukee Journal gave us a sign of spring's burgeoning baseball fever in the Cream City. The Brewers, having started the season on the road, were about to open Borchert Field for another season. THEREFORE, as mayor of Milwaukee, I am pleased to welcome the Milwaukee baseball club back to the city, and I call upon our citizens to co-operate in making the opening game of the season a real civic sport holiday. Whether the mayor was driving popular support or just riding it, Milwaukeeans took the advice to heart. The Brewers, despite injuries and a batting slump, arrived home Wednesday in fourth place and Milwaukee began to prepare for the opening game Friday. Signs like the one shown above at Herman Militzer's grocery, 4303 W. Vliet St., blossomed out. Some factories also will let as many employees as possible attend the opener. Grocery clerks and factory workers weren't the only ones looking forward to Opening Day at the Orchard. Milwaukee school superintendent Milton C. Potter agreed to let high school students out early so they could make their way to Borchert Field. Just another sign of the love Milwaukee fans had for their Brews.